renowned through the land for fun in the sun. wherever you come from, whoever you be. they'll never remember... and you'll find a richer truth. aspiring to give them a decent start. They live for the team that plays in tangerine. lifts other ordinary folks when they're down. and plucky Blackpool, our jewel of the north. Still buzzing buddy. Thank you so much to you and BST for all that you've done. This is brilliant. That's a great blog Steve. Sea...Sea...Seasiders! Blackpool are back and it's brilliant. UTMP. Steve, I'm not a football fan and I don't live in Blackpool but I found this extraordinarily moving. I had goosebumps on Saturday and cried a few tears, I don't mind admitting. I've just done the same now reading your blog. Your poem is a lovely thing and very fitting. Blackpool are back!!! How truly wonderful what you have done for Blackpool and how utterly moving your poem and introduction is. I am not a football fan but have to admit I have felt some uncanny feelings towards the Supporters ( yes, they must have a capital S !) and the Team. The joy was awesome ! Amazing job done on all fronts! Now THAT'S what I'd call a special day out, Karl Oyston (you waste of space). That's a triple whammy Steve - impassioned blog, great new poem and fantastic video of Saturday's bouncing comeback. Love it all pal. Good to see Oyston is finally out - brilliant for the fans. I was surprised when you moved up to Blackpool. I hadn't realised how passionately you felt about your football club. All credit to you though. Your collective stand against those Oystons is quite a story and makes us Gooners realise what an easy time we have of it. 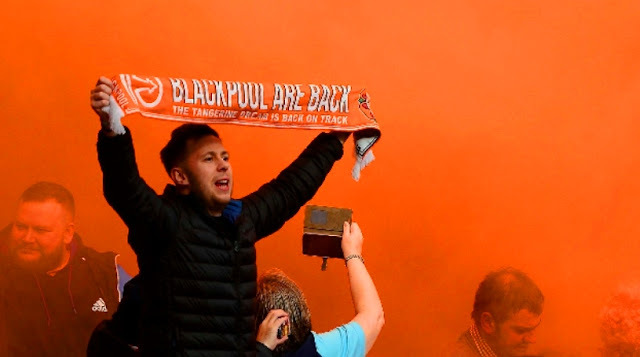 I hope your faith in a tangerine future and a better era for Blackpool is justified - one would like to think so. Keep sending me the blogs, they are terrific. Superb Steve ...and thanks for your ( and all at BST ) unfailing commitment to the cause. Looks like a busted flush is now the most valuable hand in poker !! I can't tell you how pleased for you I was to see you all back inside Bloomfield Road on Saturday. It has been a long hard fight for you and a boycott is probably the most difficult of protests to organise and keep going. But you did it and you have your club back. Many congratulations. You are a credit and shining example to all football supporters as to just how strong we are if we all stick together. Seattle Seasiders salute you. This was the next best thing to being there. Thank u & respect. I'm pleased that you fans have got your club back after so long. As for the new poem, it's clearly heart-felt. I think it works well and I like the fact that different verses have different structures and rhythms. What a great reward for your solidarity as a fanbase. Just reading this and watching the passion in that videoclip was uplifting (and I'm a Villa fan). It's a while since I visited Blackpool and then I thought it was looking a bit run down. I truly hope there's a renaissance on the way for the 'jewel of the north'. Saturday was a brilliant occasion but reality bites now I fear. Still, it's good we can go back to games and your poem captured the essence of supporting the team in tangerine. We just need a few more like Suddick and Adam in the squad of 2019! Great Stuff, Steve! The Tangerine Dream is well alive and kicking! So happy for you and your fellow Seasiders! Wishing you a great Sunday and hopefully you will come and visit us someday. Shops selling unicorn poo? Really? I'm pleased this is going down well. The fans going back Oyston-free is a monumental thing - but the hard work starts now. I'll figure the changes I want to make to the poem over time. Some of it didn't quite click yet as a tangerine paean; lacks a dimension and a degree of 'authenticity' (for want of a better label). As for Morrisey, I've not spoken with him in over 20 years. You are truly a gifted wordsmith. The Trust has been very lucky to have such a prodigious talent at its disposal. Well I like the poem Steve! I read that Oyston has had an application to appeal turned down, so it really is endgame now for the old rascal. As one of those 'fans who will flow like a tide' to Bloomfield Road again after years of NAPM, I can only say thank you to BST for becoming the conscience of our football club. This is just immense. Read it twice through & watched the video. Buzzing. Homecoming Saturday was an incredible experience and what an achievement for all Blackpool fans who took a stand. I'm proud to be counted in that esteemed company. You're right. It will go down in BFC history. Please write the book!!! 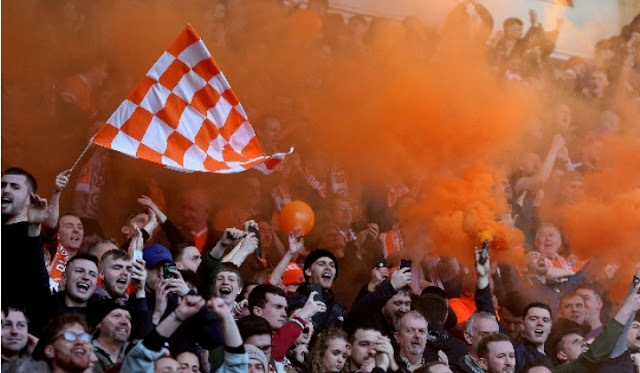 Blackpool as a challenged seaside town needs its football club to be a vibrant force as a good advertisement for the Fylde coast and for the spirits of those who live and work here - something the Oystons had it in their power to foster, especially after 2010. However, rapacious by nature it seems, they only ever thought of what they could get out of it. Now thank goodness we've got a chance to re-set and start over. Thank goodness for the clear-sighted and principled people setting the agenda in our supporters trust. You all do a magnificent job. Thank you and excuse the rant. Just fantastic. An emotional blog for an emotional event. I'm going to check out more of what you've written. Thanks for this. UTMP! Awesome blog. Love the Mighty!